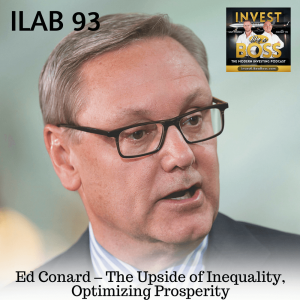 Ed Conard is an AEI visiting scholar who authored two top 10 New York Times bestselling books: The Upside of Inequality: How Good Intentions Undermine the MiddleClass (2016) and Unintended Consequences: Why Everything You’ve Been Told About the Economy Is Wrong (2012). He has written op-eds for most major news outlets and has made hundreds of media appearances. He is a retired partner at Bain Capital, where he headed the firm’s New York office. On this episode, Ed corrects the misconceptions about the middle-class wagers being squeezed by the top 1% as we are all made to believe. He gives a fresh perspective of the upsides of inequality relative to economic growth. He also shares his vision of what the U.S. economy would be like in the next couple of years. At the end of this episode, Ed discloses his own personal portfolio including how he manages his money and where he invests. Listen to ILAB 93 on iTunes here or subscribe on your favorite podcast app. 06:21 – What’s driving slow growth for the middle class? 30:02 – To what point will taxes slow down growth?